For quantitative determination of L-malate (L-malic acid) and drug effects on malate metabolism. L-malate , or L-Malic acid, is a dicarboxylic acid that is made by all living organisms and plays an important role in the Calvin and Krebs Cycle. It is a source of CO2 for the Calvin cycle in plants and is also an intermediate that forms from fumarate in the Krebs Cycle. Malate is frequently used in food and beverage industries as an additive in products such as wine, beer, candies, etc. 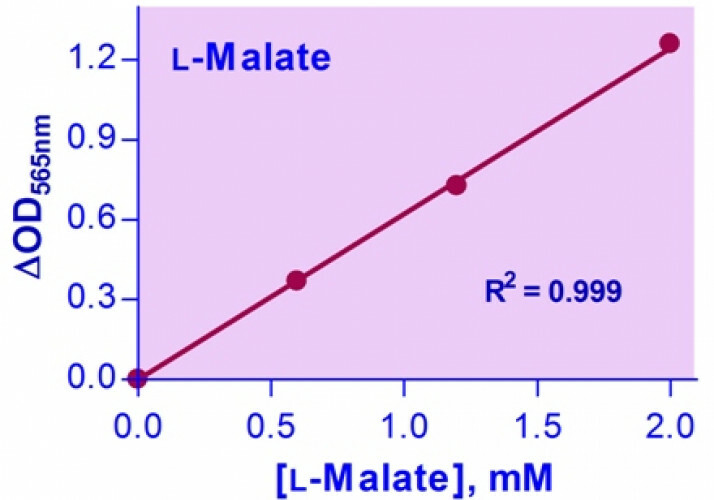 BioAssay Systems’ L-malate assay kit is based on malate dehydrogenase catalyzed oxidation of malate in which the formed NADH reduces a formazan (MTT) reagent. The intensity of the product color, measured at 565 nm is proportional to the malate concentration in the sample. 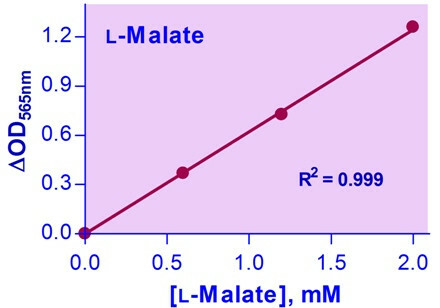 Applications For quantitative determination of L-malate (L-malic acid) and drug effects on malate metabolism. Samples Malate in food, juice, beverage and other agricultural products.